Almost 30 years ago, Paul Smith traveled to the nation’s capital to watch as the 41st President of the United States took the oath of office and his place in history. It was Jan. 20, 1989 — the day President George H.W. Bush was inaugurated. Already, Smith admired Bush as a “strong, silent type” who “didn’t need credit for what he did, as long as it got done.” But he didn’t know then how the president would have such a direct impact on his life — and the parallel challenges both would eventually face. Bush used a wheelchair in his final years and Smith has lived with physical disabilities for two decades, ever since a car accident left him with a shattered knee that would eventually require two replacement surgeries. Smith didn’t know when he was watching the 1989 inauguration that, as president, Bush would sign the Americans with Disabilities Act, a landmark law that prohibits discrimination against people with disabilities. Paul Smith stands in the visitor's center at the U.S. Capitol before seeing President George H.W. 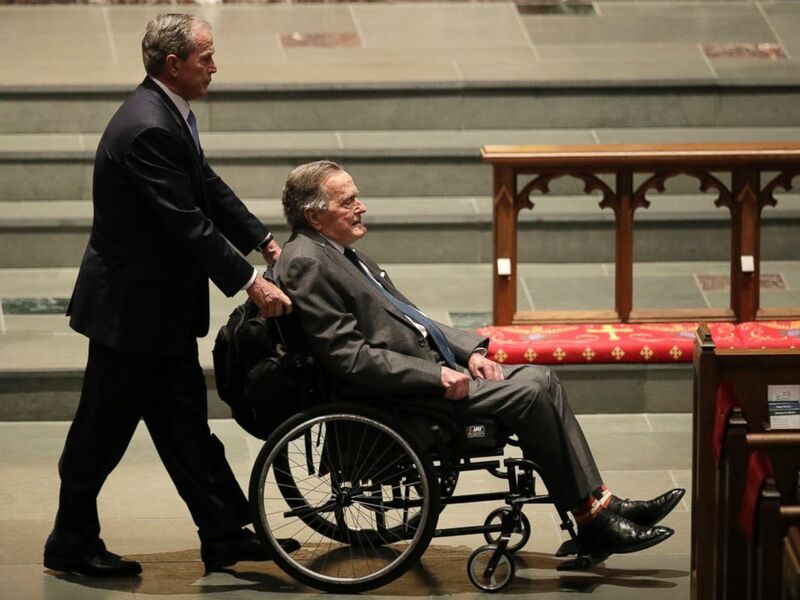 Bush lying in state in Washington, Dec. 4, 2018. 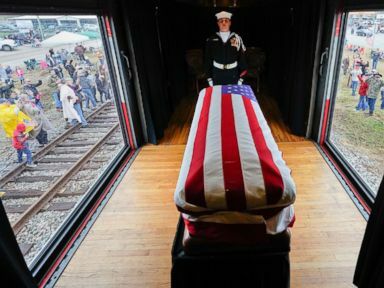 On Tuesday, Smith, 52, returned to Washington, D.C., on the crutches he’s used on-and-off for about two years to pay his respects to Bush as he lay in state in the U.S. Capitol Rotunda. He didn’t have the ease of mobility he had 30 years ago, and he was already feeling swelling in his knee from the red-eye flight he’d taken from Salt Lake City, Utah, that departed the night before. In fact, Smith didn’t even tell his wife he planned on making the trip until he was at the airport, he said, because he knew she’d tell him not to risk the issues it might cause for his knee. While he was on the plane, he worried to himself about all of the stairs up to the Capitol Rotunda. But then he remembered: “Things have probably changed,” he said. Former Presidents George W. Bush, left, and George H.W. Bush arrive at St. Martin's Episcopal Church for a funeral service for former first lady Barbara Bush, April 21, 2018, in Houston. “It makes it so I can do things like this,” Smith said. 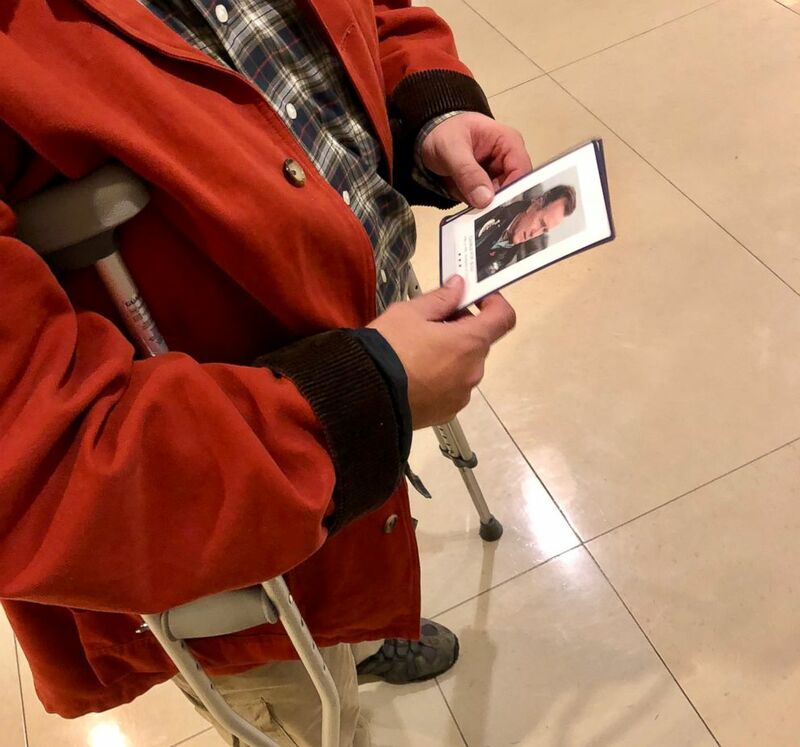 Paul Smith, 52, of Tooele, Utah, holds a remembrance card with a photo of President George H.W. Bush on Dec. 4, 2018. Smith flew in on a red-eye from Salt Lake City to see the former president's casket in the U.S. Capitol. Smith was familiar with the act's importance when it was signed back in 1990, and, like Bush, encountered people every day through his job who were affected by it. Before taking disability leave, Smith worked in customer service for Delta Airlines for 31 years. “I see it totally differently from this side,” Smith said. 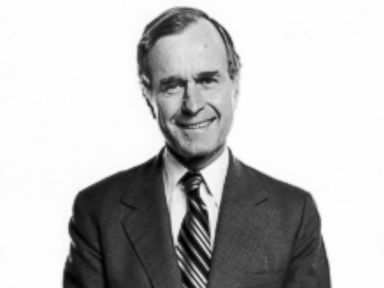 Bush, for whom the issue was already personal because his daughter Robin’s physical difficulties and, later, his son Neil’s learning disabilities, expressed the same sentiments once his battle with a form of Parkinson’s disease left him wheelchair bound. Smith waited in line for about an hour before he got in an elevator up to see Bush’s casket. Soon after he entered the Rotunda to pay his respects, members of the military performed a slow, dignified changing of the guard. Smith welled up, wiping tears from both eyes. “There I was, standing five feet from it all,” he said, describing people around him from “all walks of life” who had stopped to take a minute and pay respects to the president — “how it’s supposed to be,” Smith said. 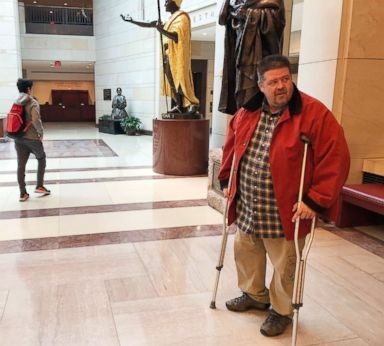 As he left, a U.S. Capitol Police officer pointed him to an elevator. Another asked if he’d had any trouble finding his way. 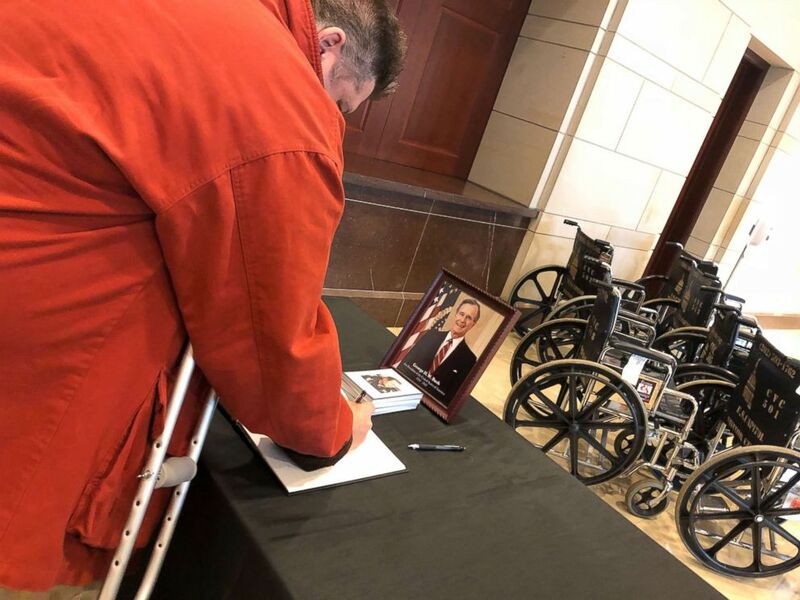 “I couldn’t do this if they didn’t have the accommodations,” Smith said as he got in line to sign a condolence book for the Bush family. Paul Smith, 52, of Tooele, Utah, signs a condolence book with a message for former President George H.W. Bush and his family as he leaves the U.S. Capitol, where Bush lies in state before his funeral service on Dec. 4, 2018.